Each Wednesday we’ll answer the on-going question: “What do I wear with these?” It’s a question we get quite often here at the shop and we love giving suggestions when helping our customers. This week we feature the Moma 80203 and the BedStu Lita. This week we feature two wingtip oxfords or “brogues” as the Brits like to call them. A must have item to have in your shoe collection. It’s “borrowed from the men” appeal makes it the perfect shoe to wear with skinnies and a button-down style blouse. Yet tailored enough to wear with a wool shift and tights for a day at the office. They dress things up bit, don’t you think? 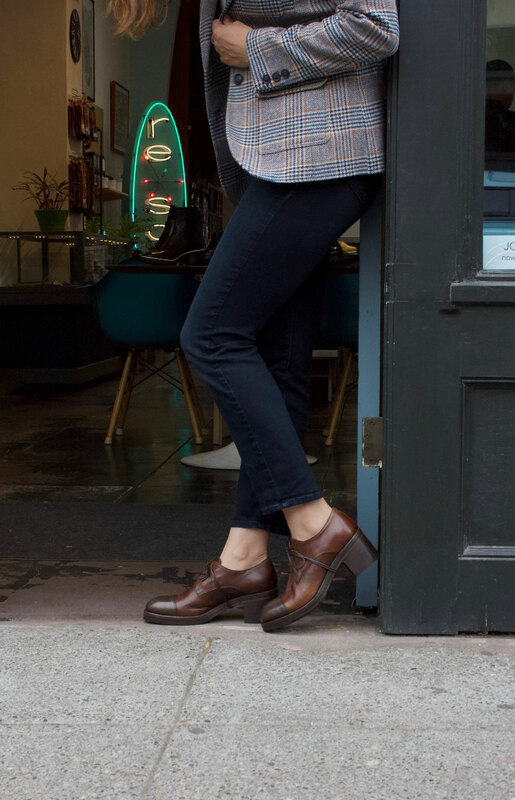 >Women’s tan wingtip oxford “Lita” by BedStu, made in Mexico. >Women’s wingtip oxford by MOMA in black, made in Italy. > DeNada ribbed beanie, in store only. > Theodora and Callum “Amarillo Tie All” scarf, in store only. > Aunts and Uncles “Mr. Puppy” bag in coffee, call for availability.